Lighting Department Stenographers, Sept. 9, 1935. Item 9929. The Seattle Municipal Archives contains records created by or for Seattle city agencies and government. These records may sometimes reveal clues about the work, activities, and interests of individual city employees and citizens. While this guide is not meant to be an exhaustive list, we hope these suggestions can give general guidance and ideas for where to start. Each record series below is linked to a corresponding guide giving details such as departmental history, dates covered, collection scope and size, and information about any existing indexes. Please note that the Seattle Municipal Archives does not hold vital records, such as birth, marriage, and death records. 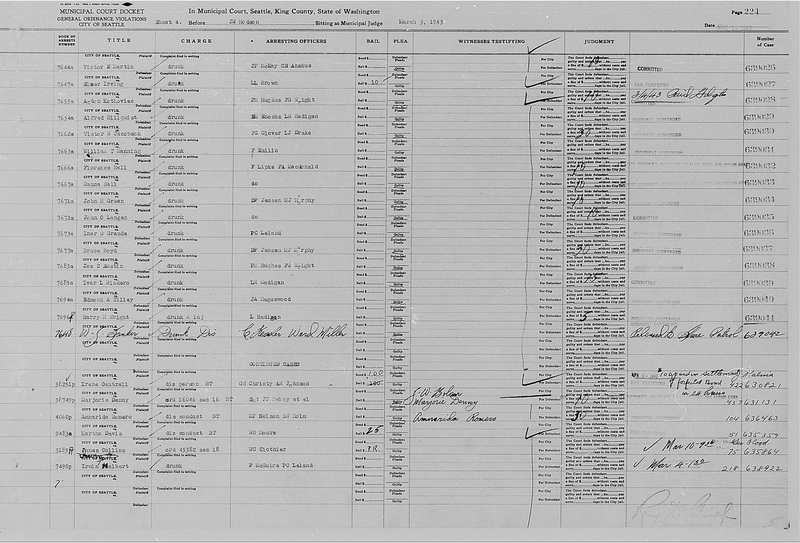 Please see this online guide from the King County Archives for information on how to locate Seattle-area vital records. Questions? Ask an archivist, we are happy to help! Did your ancestor work for the City of Seattle? 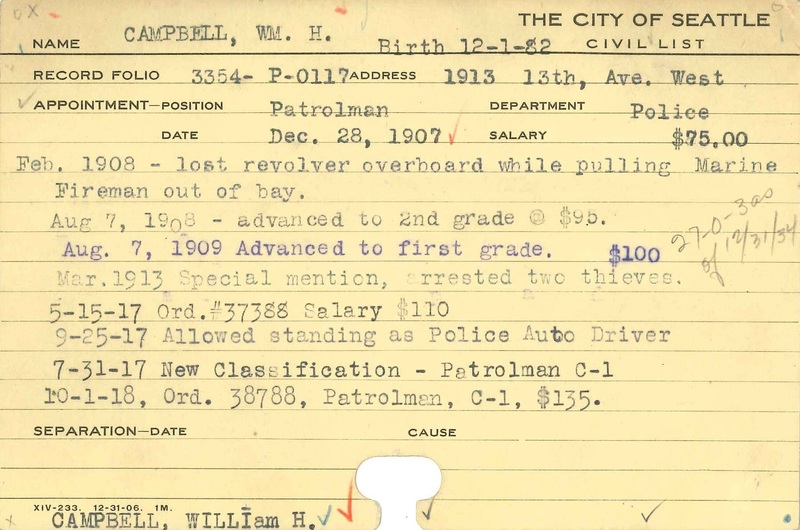 Some early personnel records exist in the Archives and may be used to confirm City service details such as job titles, pay rates, dates of service, and address. Occasionally these records may also provide glimpses into employees' personal lives. The most detailed personnel records held by the Archives are the Fire Department Personnel Records (2802-06). Besides basic service information, folders may also contain correspondence, details on disciplinary actions, reports, citations, and more. This collection has been fully indexed by employee name. Seattle City Light - Newsletters from the City Light Employees' Association (CLEA) are full of employee news and span from 1938 to 2009. Legislative records establish laws and policies, but they also document ways in which Seattle's citizens interact with the City and its officials. Records such as Ordinances, Resolutions, and Clerk Files (also known as Comptroller Files) can hold names, dates, and details relating to how Seattlites have reacted to the issues of their times, and in many cases, effected change. Search City of Seattle legislative records here. Clerk Files may be especially useful for genealogy. These documents consist of official filings of the City and include items such as letters of appeal, appointment files, contracts, petitions, and reports. Use the Clerk and Comptroller Files database to search these records from 1895 to the present. Similar official filings with the City Clerk's Office from 1874-1905 are indexed in the General Files collection (1802-04) and are available to search and view on the Seattle Municipal Archives Digital Collections website. If your ancestor appeared before a judge in a Seattle Municipal Court, we may have a record of it. Date ranges and the level of detail varies, but generally court dockets will list names and case numbers, offense, plea, judgement, and penalty. Also in the Archives is a set of Washington State Supreme Court Briefs, indexed online in Record Series 4404-01. These are legal briefs filed with the Washington State Supreme Court that relate to cases involving the City of Seattle. The briefs are printed and bound in volumes, and are shelved in the Research Room at the Archives. Case files from the Office of Civil Rights investigating employment and housing discrimination complaints may include information of interest to genealogists, such as personal and business names, statement transcriptions, addresses, and other details. The files are organized and indexed by complainant name in Record Series 3805-01. SMA's online photo database contains thousands of photos of Seattle dating from the 1880s to the present. Many show City employees at work, or citizens participating in City events. With some exceptions, people in photographs are rarely named. Try searching for a department or an event, and start scanning the faces. Let us know if you recognize someone! Photos of past City employees may also be found in collections that have not yet been digitized or indexed, and may be browsed in person in the Research Room here at the Archives. 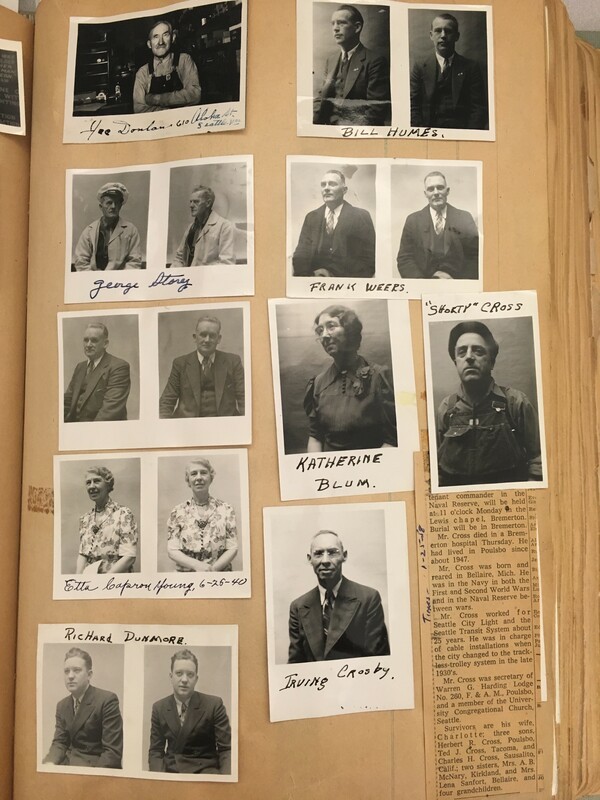 Finding any existing photos of specific people in these collections will depend upon knowing what department and approximately what years the person worked for the City. City Light Negatives (1204-01) include some pictures of employees. To find photos that have been inventoried by name but may not be online, try searching our Subject Files database for the name. If you find a record you'd like to view, contact an archivist. Before their respective annexations to the City of Seattle in 1907, Ballard and West Seattle conducted independent censuses to count and collect information about each individual living within their boundaries. 1907 Census of the Town of West Seattle (included in 1802-D1): Resulting in a count of 7,176 West Seattle residents, the census lists name, neighborhood, and occasionally age of each resident. 1890 Ballard City Census (included in 9106-03): The census counted 1,636 residents of Ballard, and listed both name and age for each resident. An electronic copy of this census is available on the Archives website. Did you know today's Denny Park was once Seattle's first municipal cemetery? When the land became a park in 1884, the bodies had to be moved. The Seattle Cemetery Removal and Reburial Register lists the names of those early Seattle citizens buried in the cemetery between 1861 and 1884, and gives the locations to where each were relocated. The reburial register is in Box 1 of the Don Sherwood Parks History Collection (5801-01) and available to view in the Research Room at the Archives. The names and property values of the City of Seattle's earliest residents and businesses are included in the Tax Lists (8004-01) and Delinquent Tax Lists (8004-02) for the City of Seattle. The Research Room at the Archives includes a collection of Seattle City Directories between the years 1890 and 1990. The directories contain name and address listings of residents and businesses located in the city, and can often give clues to marital status, occupation, and home ownership. Also available to view at the Archives are Seattle City Employees phone directories between 1972 and 2007, listing each City employee by name and giving the department where they worked. Additional genealogy records and services may be found at these other Seattle area resources. Large collection of print and online resources covering local, national, and international research. Staffed by Genealogy Librarians and local history experts with services such as genealogy classes and individual consultation appointments. Holdings include records useful for local genealogy research, such as early birth and death registers and historical property records. Online access to records and indexes from repositories across the state, covering multiple record types and topics such as vital records, naturalization records, land records, and more. Regional branch of the National Archives and Records Administration, providing access to federal records relating to Idaho, Oregon, and Washington. Offers publications, events, a research library, and genealogy research services, including obituary look-ups. Seattle library dedicated to genealogy research, with regular classes, online catalog, and a newsletter.